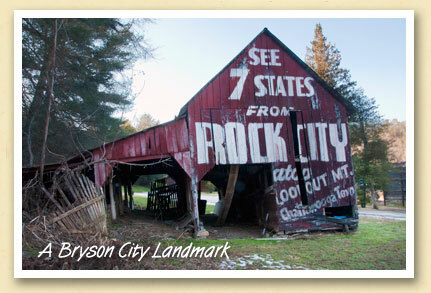 This creaky old barn is a piece of disappearing Americana — a relic of the depression and a Bryson City landmark. Byers began his project in the 1930s and continued until his retirement in 1969. In the 60s, more than 900 “See Rock City” barns dotted American roadsides from Michigan to Florida and as far west as Texas. Today, fewer than 100 remain, including this one that greets motorists entering Bryson City on Highway 19 just east of town.